This month I was assigned Gastronomical Sovereignty for the Secret Recipe Club. Kristy is a super talented social media strategist and owns the company ohksocialmedia. Her blog is packed with healthy recipes featuring all organic ingredients, so I highly suggest you check it out yourself. There were a few recipes I was deciding between, but since I had a few jars of pesto on hand, I knew this recipe would be the one to make this month. My older brother recently went to Paris and my parents went to Italy, and they both brought me back a few food-related items. One of which was pesto. Since I'm a huge fan of the basil-based sauce, I wanted to find a way to incorporate it into a meal besides just plopping it on pasta or on crusty bread. By mixing pesto along with a ground beef base, it gave the meatballs so much flavor and really complimented a simple bed of pasta. I love the idea of this and how they turned out. I can't wait to try other meat and sauce combinations in the future. Enjoy! Pre-heat your oven to 400 degrees F. Lightly grease a baking pan with non-stick spray. Set aside. Mix all the ingredients in a large bowl with your hands. Make sure it's worked in well. Make 1-2" wide balls in the palm of your hand. Place formed balls in the prepared baking pan. Place in the oven and bake for about 30 minutes, flipping halfway through. Remove from oven. Either place the meatballs in marinara sauce and serve over pasta with Parmesan cheese. Or mix pasta with olive oil, salt and pepper, then top with a little extra pesto and meatballs. I'm glad you tried the pesto meatballs. To be honest, I totally forgot about them! The perils of having a food blog for so long ;) It makes me want to make them again! And P.S. ....thank you so much for linking to my business site. You're fabulous!!! xoxo! I often find myself forgetting old recipes I've made too! It's always so fun seeing them again. And these were awesome...thanks for sharing!! mmmmmmmm these look delicious. I cannot wait to try. Love me some good meatballs...so creative! We've never thought to put pesto in the meatball mix. What a great idea! Sounds like a delicious way to change up the old spaghetti and meatball dish! I'm visiting from Group A - I did an orphan rescue that posted today. I LOVE the look of this recipe. Pesto + meatball. Genius!! I will definitely be making it soon. Thanks for sharing with the SRC. This had me at Pesto! What a fantastic week night meal. Quick and delicious. I can't wait to try it! I have SO much extra garden pesto... what a great way to use some up! Yum! 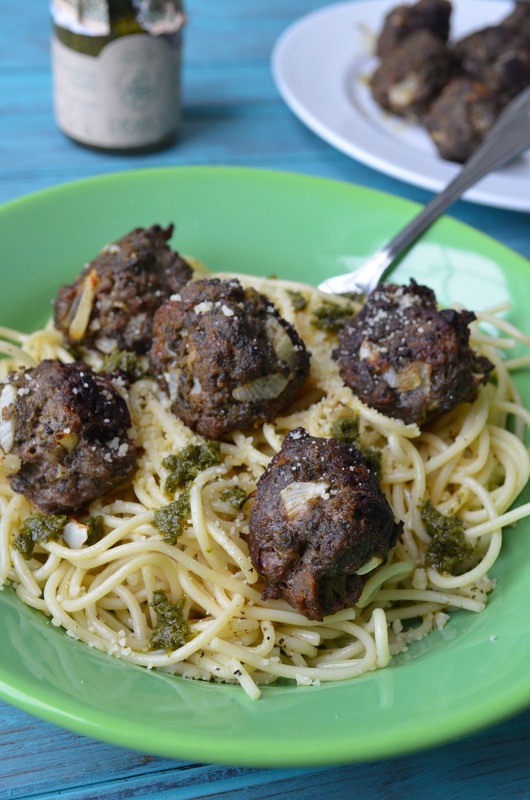 Pesto and meatballs - what a perfect combination! Glad to be part of SRC group C with you. How clever to add pesto to meatballs - of course that would give them amazing flavor, especially when served with spaghetti - this Italian-American is now hungry! Yum, these meatballs look great! Love the addition of pesto. What a great idea for adding MORE flavor to the meatballs. I always have pesto and pasta in the pantry. Now to make those meatballs.